Additional details: Image taken at Haein-sa, a Buddhist Temple in South Korea. It was founded by Master Sunung and his disciple, Ijong, on the 16th of the 10th month, 802 C.E. in the 3rd year of the reign of the 40th Shilla king, Aejang (r. 800-809). 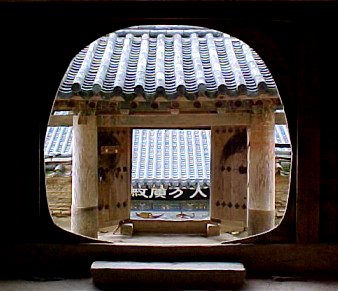 The image view looks outward from the main Library that houses the Korean Tripitaka, known as the Temple of the Dharma ... the teaching, which is comprised of 81,340 carved, wooden blocks ... the Sacred Texts of Buddhism. "I believe I only ever took one photograph in Korea, and it was of a sort of circular gateway. Must be a Korean thing: entrances in Japan are overwhelmingly straight-edged (it's my impression). Yet of course so much of the style of building things in this corner of the world originally came from China, and repeating textures in the tiles seem very familiar. The composition seems to be perfect, somehow. And you have overcome any exposure problems with the darkened interior." "My first thought looking at the thumbnail was that this was a picture on a wierd-looking TV set. I can't quite dispel this looking at the larger image - it looks more like I'm looking at a TV picture than something framed within an archway. It's actually quite a visually disturbing image for me - all the different layers of roof are confusing. Interesting." "A view of a gate through another and yet another in the distance. A Buddhist Temple, according to the caption. Reverence for the subject oozes from this picture... the slight decentering of the composition keeps it from becoming too rigid. Planar aspects of the many levels serves to collapse the space between them, giving them an illusory look. Very likeable shot." "Wow, the details are like reading a travel brochure. Very neat doorway. I don't usually try shots like this for the reason that I never seem to notice all the details while shooting and end up with the bottoms of the pillars chopped off and the structure outside the door not exactly centered in the doorway. But I see the roof appears to be quite centered so perhaps centering the rest was not possible. I don't know but those things bother me in a shot like this."